The Community Connections Mentoring Program matches children in kindergarten through seventh grade with adult mentors who have similar interests. Our program plans monthly activities in which mentors and mentees are encouraged to participate. Past activities have included Dancing Leaf Lodge near Wellfleet, geocaching, swimming, touring KNOP-TV, horseback riding, and many others. In addition, we plan community service projects in which we invite our mentoring pairs to participate. As a mentor, you will receive free admission to the Recreation Center, the Golden Spike and Children’s Museum for you and your mentee. Each month, we provide a monthly newsletter of upcoming activities and tips on mentoring. Do you pick the youth for me? How are we matched? You are an essential part of the matching process. We will give you the opportunity to attend group activities so that we can point out youth who do not have mentors. If you think you would be a good match with the youth, we will provide you further information about them. We want our matches to be successful. Can I include my kids/grandchildren in our time together? Yes, as long as you also have an opportunity to meet one-on-one. Part of the program’s mission is to enhance social and communication skills in youth. Interacting with positive peers is valuable. Where do I meet with my mentee? Our mentoring program is community-based, with the flexibility of meeting at any of your favorite locations in Lincoln County. There are many public locations that provide the opportunity to spend time with your mentee, such as the parks. You are also welcome to meet with your mentee during their school lunch period. Can we get together on the weekend? You can meet with your mentee any time that works for you and for the youth’s family. I am worried that I won’t have enough time to spend with my mentee. Mentees do not expect you to make special plans for them. They just enjoy the fact that you think they are special enough to hang out with them. Letting them go with you during your normal routine is an easy way to get to know them, and teach them a lot of life lessons. By including them when you run errands, buy groceries, or just a joy ride in town can be a great way to develop a relationship. It is also the policy of Community Connections Mentoring that each mentor applicant completes a screening procedure. At a minimum, the following procedures are required for all mentor applicants. considered until the applicant produces a case disposition. Applicants not found suitable will receive a formal letter declining their request to be a mentor. Suitability is determined by a review of all of the required screening. Any current mentor convicted of a subsequent DUI will be released from the program. Any mentor applicant with a history of alcohol or drug dependence and abuse will be required to have been sober of clean for more than three years, and meet with the screening committee to determine suitability. Male mentors will be paired only with male mentees. Community Connections will have a code of ethics signed by each volunteer prior to matching. Applicants who pass all screening processes successfully are notified and matching begins. Any mentor accepted into the program will be immediately released if convicted of any crime listed above that would disqualify a mentor. 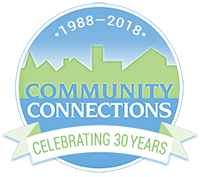 "Since 1988, working to create positive change and enhance the quality of life for children and families in Lincoln County."